The lovely team at Trek America have invited me to host a second Live Twitter Q&A all about travelling with Trek America! I’m really excited to be doing this again because I love talking about travel and I love travelling with Trek! 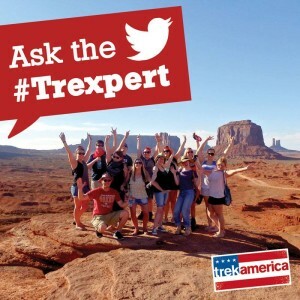 You can read about the first Twitter Q&A in my blog post Ask the Trexpert and Trek HQ! To find out more about the next Live Twitter Q&A, read about it in the official Trek America blog post, It’s time to ask the Trexpert again! The Live Twitter Q&A is happening Monday 14th July from 8pm BST for an hour. Thinking of joining us? Why not set an alert on your phone or add it to your calendar. Give yourself time to login to Twitter so that you can benefit from the whole hour. If you can’t make the whole hour you are still free to join at anytime and catch up on the conversation. If you would like to tweet the Trexpert (that’s me!) but don’t yet have a Twitter account, visit Twitter’s support pages and start with the Welcome to Twitter guide. Please note, it is possible to make your Tweets (posts on Twitter) private; if your Tweets are protected in this way, we won’t see them. You might have a good reason for keeping your Twitter account private, ensuring only those you know and allow to follow you, can see your tweets. If this is the case, consider setting up a separate Twitter account with another email address, so you can participate in the live Q&A chat. You can always delete it later, if you have no need for it. If you have a smartphone, you might also want to install one of the official Twitter apps. The following are not rules, simply some suggestions on how you can get the most out of the live Q&A event. Use the #Trexpert hashtag (keyword) in every Tweet that is relevant to the Live Twitter Q&A. If you don’t include #Trexpert in your tweets, no-one participating in the Twitter Q&A will see your question. Even if you tweet me directly by mentioning my Twitter account @Roadtrippinusa, please try to use #Trexpert in all questions and replies. Follow the conversation. You can see what others are saying by searching Twitter for #Trexpert. If you don’t know how to do this, click on #Trexpert in one of my tweets and you will see the results. Make sure you search or view “All” not just “Top” tweets, otherwise you will miss some comments. Keep on topic. If you start a conversation on Twitter with someone else participating in the Live Q&A and you start to talk about other things, please don’t include the #Trexpert hashtag. Be specific with your questions e.g. I can make recommendations on a trek to do, but it’s good to know what you like or anything you want to avoid. Be concise. When you tweet you have 140 characters to ask your question or reply (this of course includes 9 characters for the #Trexpert hashtag), so try to keep your question to one tweet. Ask one question per tweet, rather than multiple. This makes it easier to answer. Favorite the good stuff! If someone else asks a question that is useful for you too, favourite the question and answer, so you can refer to it later. This also shows us which questions and answers you find the most useful. Retweet questions and answers if you think they will be of interest to your followers. Share your tips – feel free to reply to others who ask questions. If you would like everyone else to see your replies, add a full stop (.) in front of their username when you reply e.g. “. @Roadtrippinusa” This (along with the #Trexpert hashtag) will ensure that others see it too. Plan your questions. You are welcome to tweet your questions before and during the Live Q&A, but they will only be answered during the event. If you have a few questions you would like to ask, why not type them up in a note app first and then you can simply copy and paste them when you want to tweet. This way, you won’t forget to ask an important question. Remember to include the hashtag though and the 140 character limit per tweet. Tweet the Trexpert and win! Remember @TrekAmerica will be online too and we will be looking to reward the best question with a Trek America goody bag! So get thinking of those questions you’ve always wanted to ask about travelling with Trek America! Some of you may also be featured in Trek America’s summary of the Q&A, which will be published after the event. I’m looking forward to chatting with you on Monday – don’t forget, it starts at 8pm BST and both new and experienced trekkers are welcome! Do you have any other tips to share or feedback? Let me know in the comments, below. 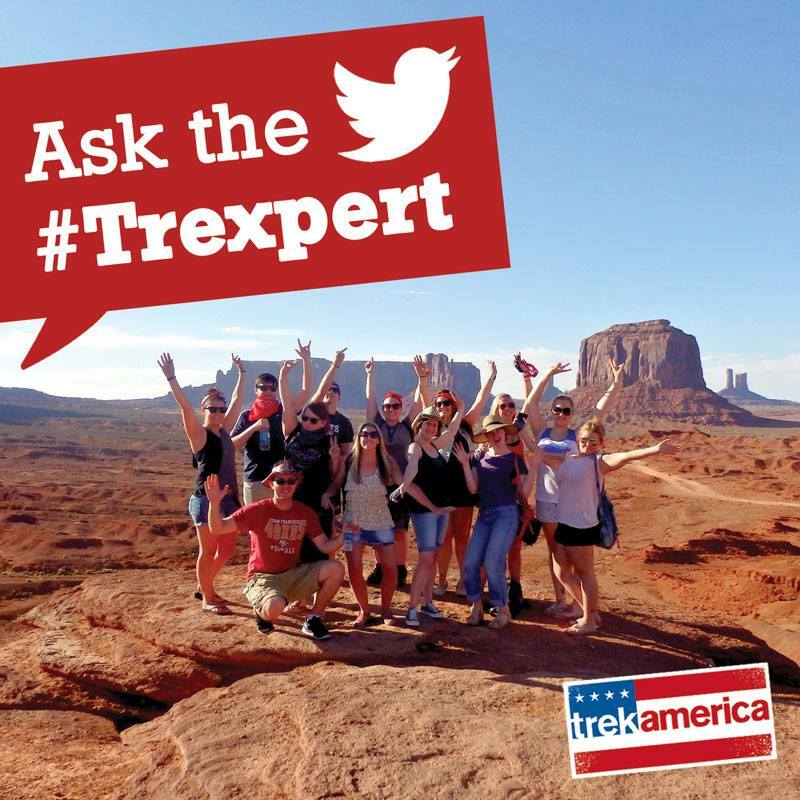 If you missed the Twitter you can read some of the Q&A in this Trexpert Twitter chat Storify summary, curated by the Trek America team.